The landscape of Search Engine Optimization and link building is continuously changing, and today, the need to understand the importance of link building is higher than ever. Not long ago, Google’s Andrey Lippatsev revealed that Link, content, and RankBrain are the top three ranking factors in Google search algorithm. It is critical to implement high-quality campaigns if you want to compete and make it big in the digital world. This article explores some of the link building strategies that will put you ahead in the competition. But before we discuss these strategies, let’s learn about link building and its importance. The process of securing links from external websites to a page on your site is commonly referred to as link building. A link, also called hyperlink, is a reference to data that allows users to navigate between various pages on the internet. By analyzing the links, search engines discover how the pages are related to each other. In the vast metropolis of the web, links are the streets that the search engines crawl. Search engines use complex algorithms to analyze links and rank them based on their popularity, credibility, and some other factors. So, the more credible pages backlink to your website, the more chances it has to rank higher in the search engines. There are many techniques and strategies used for link building, each with its level of difficulty. Link building is an intricate part of an SEO’s job. Most of the SEOs spend the majority of their time trying to build high-quality links that would drive traffic to their website. Below are the strategies that you must follow if you want to improve your website ranking. If you are looking into link building, you probably are already producing blogs, social media posts, and videos. You need to ask yourself a question whether or not the content you create is link worthy. Create useful content that brings value to the visitors. If you are creating content only to keep up with your schedule, you are not bringing anything new to the table. Hence, no one will link to your post which will lower its ranking in the search engines. If you haven’t considered guest posting yet, we highly recommend you look into it in 2019. Guest posting is an effective way to garner backlinks. Many websites allow you to write blogs that may include a backlink to a page on your site. Reaching out to these websites and writing a blog post for them is also an effective way to attract the attention of the website’s visitors, thus widening your audience reach. The company you reached out to gets free content while you get to link your site within the blog; hence, everybody wins. You don’t need to exhaust yourself by writing blogs every day of the month and reaching out to hundreds of websites to publish your blog post. 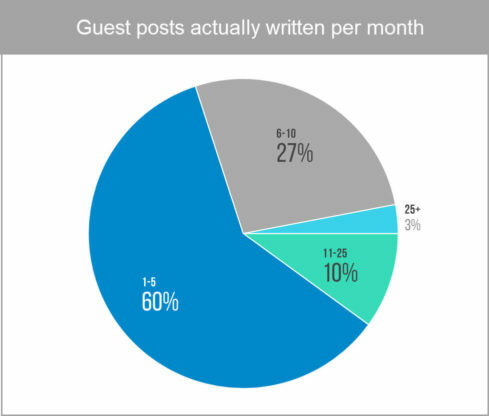 According to a survey, more than 60 percent of companies write only 1-5 guest posts per month. Personal opinion can be helpful to the audience, but if you want to come off as a credible and reliable source and procure lots of backlinks, you should include facts and stats in your content. This is the reason why the most shareable content includes research papers, case studies, and reviews. Equally important is to write fresh content as people are continually looking for new material on important topics. All the relevant data in your research must be appropriately linked which will make you a reliable source of info in your niche. You will get more mentions and backlinks as a result. In time, people’s lives have become busier, and their average attention span has considerably reduced. As a result, it has become more difficult to attract them by a stuffed article with too much content to read. A better practice, therefore, is to include visuals in your content as our brain processes visual information much faster than text – 60,000 times faster to be precise. Different people grasp information at different rates and in various forms; your business message should be presented in every form so that it can attract the attention of a wider audience. Sometimes a webmaster may misspell your link, or the location of your page may change resulting in a broken link to your website. When this happens, the backlink returns a 404 error. Another reason why such an issue may occur is when a site is re-launched or migrated to a different domain. In either case, the backlinks shall be redirected to another page. There are various link research tools available to help you find the broken links on your site that are linking to a non-existent page. You should either recover such pages or redirect the links to an existing page. Another strategy to rank higher for keywords of your choice is by analyzing your SEO competitor’s links and using them as a model base for your own. You need to evaluate the links, those linked to them, and why are they linked? Google the competitors for guest posts which will show all the sites where they have written guest posts. Analyze their work and try to figure out what makes it stand out. You need to add these sites to your guest post targets. Also, look for the keywords and phrases that your competitors have used in their blog posts. You need to incorporate similar words to create more relevant content for the same site. This is a smart way to steal your competitors’ links. A resource page is a page on a website that lists useful resources and links for a particular topic. It is a powerful way to build high-quality links to your blog or website. To place your content on a resource page, you need to locate pages that contain similar content in your niche. This is done simply by typing the relevant keyword/s in Google which will pop up a number of resource pages. Inspect each page and find a blog post from your site that best fit the resource page. Including your website on a resource page can significantly increase the chances of getting backlinks. Another strategy you need to follow to rank higher is the Link Roundup. Link roundups refer to daily, weekly or even monthly blog posts that are linked to valuable content. You need to look out for such link building opportunities and contact them to include your content in their roundups. The link roundup technique is an effective way to build backlinks and drive traffic to your website. Creating high-quality backlinks is an integral part of any successful SEO strategy. These link your website across the web; thus widening your audience reach and spreading your message far and wide. However, this is a tough task and may require a team of professionals conduct it for you. By following these tips and link building strategies, you will be well on your way to online success. Google’s De-Indexing Issue – Not Fixed Yet! How to Build Links in Difficult Niches? © 2019 Link Building HQ.